Delivering versatile and contemporary lighting for virtually any space, the compact 2” luminaire accommodates ceilings with just one-half to one inch thickness. This recessed down light is ideal for the clean minimalist expression that is preferred in newly constructed modern buildings today. With features such as vertical and horizontal adjustment, choose from round or square, trim or trimless, and an array of finishes. 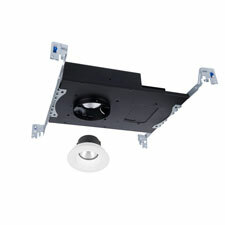 The IC rated, airtight universal housing accepts three types of trim: a down light for general illumination with superior glare control; an adjustable accent light with 0-25° index-based precision aiming; and a wall washer that illuminates with an innovative patterned lens. The luminaire uses just 15 watts while delivering up to 1405 lumens. It offers a CCT (correlated color temperature) ranging from 2700K to 4000K with 17° spot to 50° wide optics. The extreme shallow recessed down light minimizes a loss of ceiling height when using furring strips. Its gated access door is designed for installation below the ceiling line. The 120V-277V Universal Voltage driver dims down beautifully to just five percent, with ELV, TRIAC or 0-10V dimming capabilities. The LEDs have a 50,000-hour rated life. Trim or Trimless styles are available. Aether is CEC Title 24 compliant and wet location listed. WAC Lighting believes that a key part of being a Responsible Lighting company is to provide a product offering that is progressive in both design and technology. Groundbreaking innovations in LEDs, materials engineering and creative optical design are paving the way for endless possibilities. With over 100 engineers on staff across four factories in the US and China, WAC puts creative and forward thinking minds behind solving the most challenging lighting needs with lighting technologies. All designs are thoroughly tested in the company’s internationally recognized NVLAP, UL and ETL certified testing laboratories for safety, durability and robust long-term performance far beyond required standards. With over 1 million square feet of fabrication and manufacturing capabilities, WAC offers an industry-leading infrastructure that turns concepts into fast to market products. But above all WAC is a company that cares about employees, products, and reputation and clients. As a family owned business WAC chooses to manufacture products responsibly with zero landfill impact and help to preserve the planet for our children and grandchildren. Its merit-based mission is to build the most respected lighting company and be a shining example of American ingenuity. WAC Lighting Global Headquarters is located in Port Washington, New York, with Factories in New York, California, and Georgia, as well as China. WAC Lighting can be reached at 1.800.526.2588 or by visiting www.waclighting.com.